Located on SR 234, right next to Shades State Park and Pine Hills Nature Preserve. 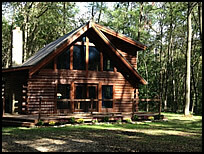 Traditional Cabins - The fully restored Rustic Log Cabin accommodates 8-10 people in three bedrooms with a modern kitchen and two updated baths. There is a large and cozy Indiana limestone fireplace, yoga loft, wraparound porch, and a large 24x24 patio for lounging and stargazing in one of the darkest spots in the Midwest. 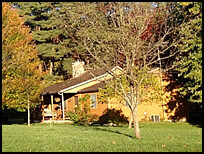 The remodeled Farm House sits 3 acres away through dense woods and can accommodate 8 people comfortably. It has a vaulted ceiling with a wood burning fireplace and has been completely remodeled with a new kitchen, tile in the bathrooms, and a large screened in porch.